When it comes to westerns-- you have to be quick or you're dead. When it comes to junkies-- you have to quit or you're dead. Blending the gritty reality of Steven Soderbergh's Traffic, Danny Boyle's Trainspotting, and Darren Aronofsky's Requiem for a Dream with Ridley Scott's American Gangster or Wai-keung Lau and Siu Fai Mak's Infernal Affairs trilogy (remade by Martin Scorsese into his Oscar winning The Departed)-- writer/director Derek Yee's nine-time Hong Kong Award nominated 2007 reality based, urban drama seems upon first glance to be an unlikely fit for the high flying kicks, helicopter jumps, and bullet strewn ballet on display in most pictures from the excellent Dragon Dynasty collection. And while one of Protege's nominations was indeed for its action choreography, those accustomed to the pace and intensity of the recent Dynasty epics will find this one a bit lacking in the action department although its major similarity is in its all-too-familiar set up of an undercover cop who's been under for so long (in this case seven years) that the line seems to be blurring between his life as a police officer and his double life as a low-rung drug runner. 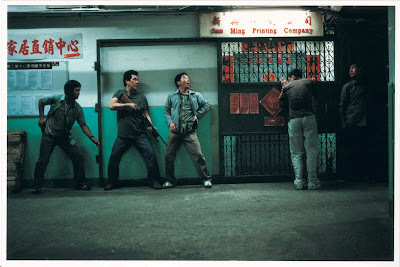 Having steadily built up a near family like relationship with his drug kingpin mentor (the legendary Andy Lau from Infernal Affairs and House of Flying Daggers), Legend of Black Scorpion's Daniel Wu's undercover cop Nick is perched to be on the verge of finally getting to the top of Lau's empire so that he can bust the entire ring. While he's got more than enough on his plate working for Lau's Kwan, Nick becomes increasingly attracted to his addicted neighbor Fan (Zhang Jing Chu) and becomes involved when he realizes that she and her young daughter live in near poverty without food. While the drug business had always been matter-of-fact in his line of work and dismissed casually in Kwan's defensive "we're just supply and demand" businessmen soliloquies, as Wu gets closer to Fan and her daughter, forming a near surrogate family which we know will end in devastation given the film's heart-wrenching opener which finds the daughter throwing away her mom's used syringe after she shoots up in plain sight-- Nick's close calls to getting busted with a blown cover are threatened when gung-ho cops intervene. Adding even more conflict is the predictable arrival of Fan's scumbag ex who may or may not have gotten the lovely woman hooked on drugs and while those scenes seem a bit underwritten and overly melodramatic, we can't help but watch in frantic anticipation-- predicting the inevitable but wishing there was some way to intervene-- much like Wu's Nick who ultimately has to come to the resolution that it's up to the addicts to quit or they're dead. Book-ended with an eerie voice-over by Nick as he discusses the part that drugs played in the death of two characters he names from the start (so their demise is expected but nonetheless upsetting) and questions whether the emptiness that makes a junkie score is worse than the junk itself-- while Protege is a bleak but compelling work that seems as though it would be ripe fodder for a stateside remake and as Dragon Dynasty's press release reveals it is in fact "based on true stories of undercover agents on the police force," it's still damn hard to watch. Likewise, the idea that you'd want to include Protege as one of Dragon Dynasty's repeat-play worthy titles (a la Supercop or The Enforcer) is highly unlikely. Filled with rivetingly authentic performances which did in fact raise suspicions in certain press coverage regarding just how much research the actors did in preparation-- true to the Dynasty M.O., it's loaded with great interviews and extras regarding the making of the film and the commitment involved by its cast and crew including an interview with Zhang Jing Chu, Daniel Wu, producer Peter Chan, the company's trademark feature commentary with its resident "Hong Kong Cinema Expert Bey Logan," as well as the original theatrical trailer.